Rok:Modul Vox review | What Hi-Fi? There’s an argument to be made against having all your kit out and on display. Maybe you have wandering children or pets. Or you want to hide your cables away, perhaps at your partner’s behest. The Rok:Modul Vox solution is to put everything inside this cabinet. It’s a very nice cabinet: nicely finished, solidly built, and with some excellent ideas. It offers passive ventilation in the form of slots in its base panel, and an upwards-angled mesh at its rear (as opposed to a closed back). Silicone is used to add a degree of extra dampening: these are found on the shelf supports and on sticky pads that you attach to your speakers. The cabinet has eight spiked feet, which are adjustable. Included in the package are special cups for the spikes, in case you don’t want to damage your hard floors. Door hinges are strong and swing smoothly, but for further alignment these are also adjustable. The top part of the cabinet opens up to hide a soundbar or sideways speakers. Its door is made of the kind of fabric that you’d find on the average speaker grille. The bottom left and right hold adjustable shelves, which hide behind glass doors. Drawers are optional, for an extra £50. 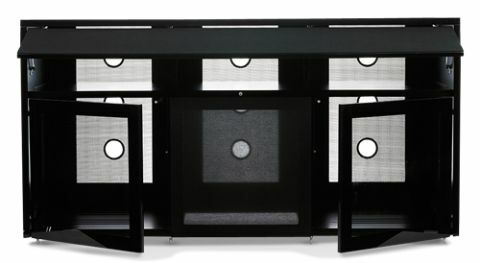 Speaking of options: the cabinet comes in glossy black or white, and you can choose what kind of compartments you want. The cabinet is available in three sizes, with prices ranging from £600 to £1000. Our test unit was the middle size. The two larger sizes have a cubbyhole for your subwoofer, which sits directly on your floor via a cut-out in the cabinet’s floor. This is designed to isolate the subwoofer and reduce its impact on the rest of the enclosure, although we found our kit vibrating nonetheless. In use, we were disappointed. Inside the cabinet, our speakers sounded reverberant, with unruly bass and less detail compared to when using speaker stands. We’d be willing to trade a little sound quality for the neatness and convenience, but we felt the sacrifice was too large. We also weren’t keen on putting a TV on top: we found it to be too high, particularly when using a larger screen. As a piece of furniture, the Vox has many good ideas, but that doesn’t necessarily translate to an enjoyable AV experience. Not quite revolutionary, then, but it sure is neat.